Week 7-Dessert week of GBBO has been and gone and the challenges to my mind are getting harder and harder. This week we saw contestants make Roulade as the signature challenge, followed by technical challenge of making Marjolaine, a layered meringue with cream and nuts followed by the show stoppers Mousse cakes. All the bakes looked extremely difficult and you could clearly see the stress on the contestants faces as they struggled to create the perfect bake. This week I have attempted to create my own version of the mini mousse cakes. 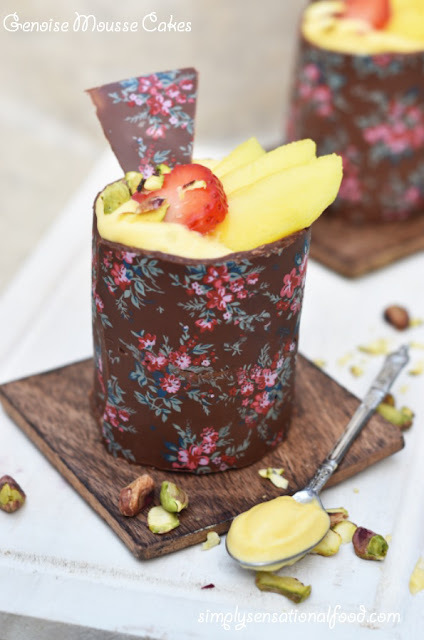 I have used a vanilla genoise sponge recipe from GBBO and made a vegetarian mango and cardamon mousse topped with fresh mangoes and strawberries and finally finished off with a decorated chocolate collar around the mini cakes. Light Genoise sponge topped with delicious cardamon mango mousse and garnished with fresh mango and strawberries and pistachio nuts. 1. Preheat the oven to 200 degrees C/ 400 degrees F2. Line a square tin with grease proof paper and keep it aside.3.Place the eggs and sugar in large bowl and set it over a bowl of barely simmering water, making sure the bottom of the bowl does not touch the water. Beat with an electric whisk until the mixture is thick and fluffy then remove the bowl from the pan and continue beating for three minutes.4. 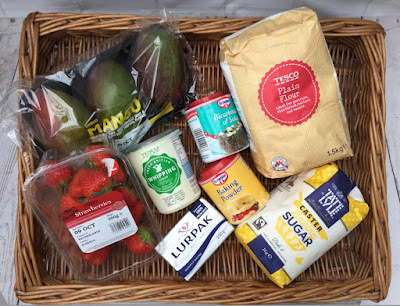 Add the melted butter and then gently fold in the flour.5.Transfer the batter to the prepared cake tin and smooth the top.6.Bake the cake for 25 minutes or until a skewer inserted in the centre comes out clean.7. Remove cake from the oven and leave to cool.8.To make the mousse, whip up the cream with the icing sugar until it forms stiff peaks.9. Fold in the mango puree, cardamon and vanilla essence very gently. Place the mousse in the fridge to chill.10 Peel the mango and cut it into thin slices.Hull the strawberries and cut them into thin slices.11.Using a cookie cutter that is 6 cm in diameter, cut 6 round cakes from the large cake, any off cuts can be used for making trifle.12. Break the chocolate and melt it in the microwave at 30 sec intervals until its melted. Remove from the microwave and keep aside.13. Cut the chocolate transfer paper to fit around the cake rounds and cut 6 sheets. Make sure they are at least 1 inch taller than the cake as there will be need to be a cavity to fill the mousse.14. Place the chocolate transfers on a baking sheet and using a palette knife thinly spread the melted chocolate on the design,15 Place the tray in the fridge for the chocolate to semi set for about 5 minutes.16 Remove chocolate wrapper from fridge and wrap them around the cake rounds. Return the chocolate wrapped cake back to the fridge to set completely. (about 1 hour)17. Remove the chocolate covered cakes from fridge and gently peel off the plastic wrapper to expose the chocolate design.With a sharp knife level the top of the cups.18. Spoon the mousse on top of the cakes and return the cakes to the fridge for 30 minutes.The mousse has no gelatin so it will not set fully but the chocolate sides of the cake will hold the mousse.19. 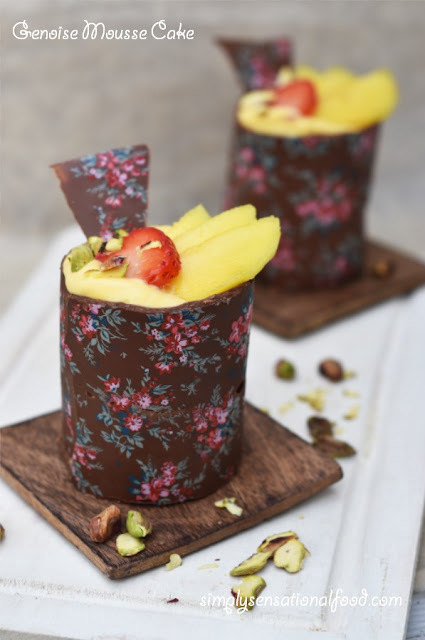 To serve garnish the mousse cakes with mango slices and strawberry slices and sprinkle pistachio slices. These look like a lovely alternative to a traditional cake. I haven't been following GBBO this year as I've been busy lately, must try to get into it soon! Oh my goodness!! These look AMAZING! Seriously, I really want to make these now. I think these would be great for kids, they have fruit in, too! They sound fairly easy to make, too! Ahh, I am pinning this post to pinterest! Wow! These sound and look beautiful! You can get chocolate transfers from cakecraft or amazon. oh wow these look amazing. I love the transfers on the chocolate it looks so fancy. These sound pretty easy to make too, I always thought genoise and mousse would be very difficult. I'll have to try this recipe out. These mousse cakes look amazing! I actually prefer mousse cakes to traditional cakes, they're much lighter and they're made with fruit too, yum! These looks amazing! I love mousse cakes because they are much lighter than traditional cakes. So yummy! This looks very tasty. Never seen anything like this before. what a beautiful creation Nayna, I love watching the GBBO and the tension is tent radiates through from my TV screen hahaha, I wish I had more time to bake though ! I've never used chocolate transfers like that before - it's so gorgeous! So effective. What a lovely little treat! These are so beautiful and ai love the flavour combo. These are so elegant! You really rose to the challenge! Oh that looks gorgeous I will have to save this recipe! Your dessert is absolutely stunning! This cake looks so pretty and too lovely to eat. Mousse cake sounds so exciting. Wow Nayna, such a pretty looking dessert. If someone offered that to me, I'd probably would not want to spoil the art work. I've heard and seen the pretty chocolate design on truffles and desserts but have no idea what the design sheet looks like. Would love to see it. I have never tasted a mousse cake.. sounds interesting.